The first ship to incorporate a substantial addition of balconies to an existing design was the Norwegian Sky, which came from the uncompleted hull of the Costa Olympia, a ship that was originally intended to be a sister ship of the Costa Victoria. Since that time, the Costa Victoria herself has had balconies added and the follow-on order to the Norwegian Sky, the Norwegian Sun, was completed to a similar design, with balconies included. Celebrity Cruises' Century was one of the few ships also to have had balconies added, and last week her once fleetmate Galaxy re-entered service as Mein Schiff, again with added balconies. More ships will soon follow from Carnival and Holland America. Meanwhile, Steve Wellmeier, executive director of the International Association of Antarctica Tour Operators, has also written us with some updates on last week's column. The Norwegian Sky has an interesting history. Originally one of two cruise ships ordered from Bremer Vulkan, Costa managed to take delivery of only the Costa Victoria, before the shipyard went bankrupt in 1996. As delivered, the Costa Victoria had no balconies at all, but when Norwegian Cruise Line later acquired her sister ship Costa Olympia, they redesigned her by adding 252 "clip-on" balconies that were welded onto the two upper decks of the existing structure, thus opening up a vast number of outside cabins to the more exotic world of private balconies and fresh air at sea when she was finally delivered in 1999. The design proved so successful that NCL commissioned the Bremerhaven successors to Bremer Vulkan, Lloyd Werft, to complete another ship to the same design, with some modifications based on experience, and she was delivered in late 2001 as the Norwegian Sun, with the same 252 balcony count as her near sister the Norwegian Sky. Watching from Italy, meanwhile, Costa Cruises, which had been acquired jointly by Carnival and Airtours in 1997, were fascinated by what had been done with their own original design but were too busy adding more new ships to their fleet under Carnival control to do anything about it. In July 2000, for example, they added the Costa Atlantica, and that August Carnival bought out Airtours' share to assume full 100% control of Costa Cruises. Many Carnival-designed cruise ships with plenty of balconies would follow to two classes based on Carnival's original Spirit and Destiny type hulls. 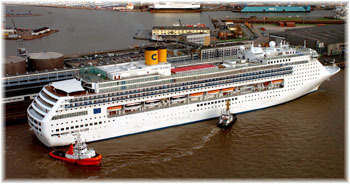 Finally, though, in 2004, with her revenue-generating capabilities severely restricted by an absence of balconies, Costa sent the original ship of that trio, the Costa Victoria, back to Bremerhaven to have balconies retrofitted. Based on their experience with the two NCL ships, Lloyd Werft was able to add 246 balconies over two decks in a very similar way to the way they had fitted the two NCL ships, and Costa received a ship that could generate more money. Meanwhile, Celebrity too had been building more ships with more balconies. They decided to try something similar, but on a much larger scale, by adding three decks of new private balconies to their own Century. Delivered in 1995 with 61 balconies, she was taken in hand in 2006 and re-delivered with 314 new balconies over three decks. Together with several new suites, this brought her balcony count up to 386, compared to 590 on the line's Millennium class ships. As with Norwegian Sky and Sun and Costa Victoria, the new balcony count on the Century came to something over 100 per deck. This time, however, the work was done in the Palermo shipyard of Fincantieri, which also undertook some major onboard refurbishment as part of a $55 million job. As passengers will pay more for a balcony cabin than they will for a simple outside cabin, no matter how large, all of these ships now have much-enhanced revenue possibilities. A near sister ship of the Century, delivered a year later to a lengthened design, was Celebrity's Galaxy, which when she entered service in 1996 featured a greatly expanded 220 balconies compared to Century's original 61, a major change in itself. Earlier this month, however, the former Galaxy re-entered service as TUI Cruises' first ship, named Mein Schiff. After a ¤50 million refit at Lloyd Werft, who did the original trio, she received an additional 200 balconies and 202 balcony extensions, bringing her balcony count to 420. In addition, the whole ship was redone to suit German rather than American tastes and she indeed appears to be quite a handsome vessel internally. 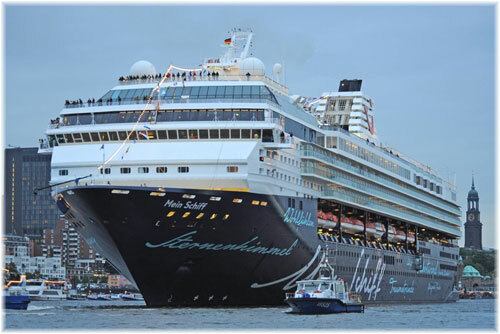 Mein Schiff entered service a week ago today on her first cruise for the German market and more ships are to be added. Could the Celebrity Mercury be the next to join her? Meanwhile, the Carnival drawing boards have been coming up with some revenue-enhancing schemes of their own that could see 98 new balconies added to each of eight Fantasy class ships. Since these ships were completed to an old-fashioned plan where the lifeboats were installed on the top deck like the old Queen Mary, they have a problem adding balconies that will not get in the way of the lifesaving equipment. The ships we have discussed so far all have lifeboats located on the main deck closer to sea level, making it easy to add balconies above that level. Not so with the Fantasy class ships, however, where any new balconies have to be added out of the way of lifeboats. That means at the stern and in some of the very few areas where lifeboats do not need to be launched in an emergency. The first ship to undergo these modifications was the Carnival Sensation this January. Because of her lifeboats, only 24 new balconies could be added amidships (plus extensions to 12 existing balcony cabins) where an existing superstructure extension meant there were no boats, but the other 74 have all had to be installed at the aft end well clear of the lifeboats. This has lead to an appearance totally different from all other balcony conversions to date, but it will almost triple these ships' balcony cabin inventory from the existing 54. In fact, if the same is done with all eight Fantasy class ships, Carnival will have added 784 new balconies to their fleet. To show just how valuable these balconies are Carnival designers have also come up with a way to add half a dozen balconies to each side of Holland America's "S" and "R" class ships that also involves a clip-on. The first ship to receive this treatment was the Veendam, which went back into service earlier this month with extended stern accommodations as well as her clip-ons. Other ships in the Holland America fleet are receiving additional verandah cabins aft but in new accommodation blocks that have been added to the original design. As part of the Veendam's refit, her bridge wings have had top be extended to give the officers a view past the new clip-on balconies that have appeared just under her old bridge wings. After our column last week headed "Good News for Antarctica?" we heard from Steve Wellmeier, executive director of the International Association of Antarctica Tour Operators, with some interesting additional information, for which we would like to extend our thanks. Steve mentions that the 400-passenger limit we mentioned last week was in fact raised to 500 a few years back. This affects ships such as the Marco Polo and the Discovery. He also makes the important distinction that it is not only heavy oil that is included in the new regulations that would see not only its use but its carriage banned below 60 degrees south, but also intermediate fuel oils. This in turn could affect as many as eight of the small to medium size operators (fewer than 500 passengers) whose ships burn intermediate fuel oil. This is ironic, in some respects, because the Antarctic Treaty Consultative Meeting (ATCM) that asked IMO to look into this issue (Stockholm, 2005) requested that fuels heavier than IFO-180 be considered for banning, not IFO-180 itself. Also, this original request by ATCM did not include the restriction on carriage." He also points out that each of the large "cruise only" companies engages an ice pilot for the time they are in the Antarctic and where possible try to staff their bridges with officers with polar experience. They stay well clear of land, usually 1.5 nautical miles and in well-charted areas and when they do venture close to shore, as at Culverville Island to see the penguin colony, they do so in well-charted lanes and only in excellent weather. Steve added that one operator we did not mention in last week's column was Abercrombie & Kent, who have been well known in the region for many years and latterly Swan Hellenic's Minerva as the Explorer II. 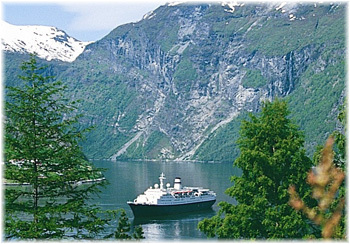 Also that Transocean Tours has of course succeeded Orient Lines as operators of the Marco Polo. He says that Antarpply operate the Antartic Dream, with whom Oceanwide have an agreement until they receive delivery of their own new Plancius. And he reminds us that several German operators such as Delphin (Delphin, 375 berths), Phoenix Reisen (Alexander von Humboldt, 470 berths) and Plantours (Vistamar, 290 berths), as well as the French operator Ponant Cruises (Le Diamant, 226 berths), are also active in the region.